There are two main types of LPG pipe available in the catalog and both are sold in rolls that allow the cutting of the most suitable piece to use. In the first case we have a LPG pipe made of a PVC-based material, a versatile and flexible material, which replaces the rubber in healthy environments such as homes, where the risks of pipe abrasion are much lower. It is made according to the UNI 7140 standard to connect users of reduced power. 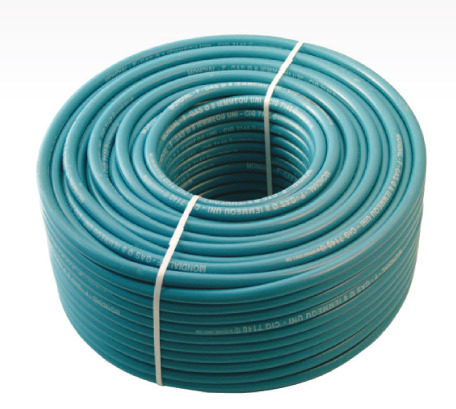 Sold in rolls of 10, 50, 100 meters and it is a pipe that according to the reference legislation cannot connect devices more than 2 meters distant from the gas intake point. The inside diameter in one case and in the other is always 8 mm for mounting on the dedicated hose holders. In the second case instead the standard EN ISO 3821 (EX EN 559) provides a LPG pipe with an increased outer diameter and the use for the construction of NBR and EPDM rubber which makes it more resistant to abrasions and crushing. The use of this particular type of LPG pipe is also allowed in industrial equipment such as welding systems, this is also due to the fact that the reference standard does not limit the length of use. 15/12/2015 Pipe for methane gas and the reference norm A multi-layer PVC pipe for methane gas with an intermediate layer in woven material for the sake of improving resistance to pressure.